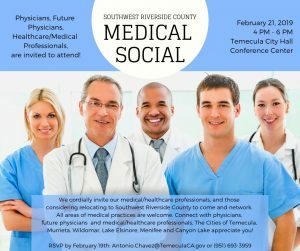 Come Join the SW Riverside County Medical Community for a Medical Social on February 21, 2019 from 4-6 pm. This is a networking event among six cities in Southwest Riverside County and our growing medical community. We cordially invite our medical/healthcare professionals and those considering relocating to Southwest Riverside County. Physicians, Future Physicians, Healthcare/Medical Professionals, are invited to attend! O U R R E G I O N A P P R E C I A T E S Y O U ! -What do we know about Cancer in the Region? All areas of medical practices are welcome (not exclusive to cancer care). Menifee and Canyon Lake appreciate you!